. . . and Bureau, Henderson, Randolph and Shelby Counties. You don't have to travel to Iowa to see covered bridges. There are five historic covered bridges remaining in Illinois. All are significant enough to be listed on the National Register of Historic Places, and all were built to carry horse-drawn wagon traffic over Illinois' rivers and streams. Two other covered bridges were destroyed by arson — the Washington Street Bridge in Sangamon County in December 1977, and the Wolf Covered Bridge in Knox County in August 1994. There were more than 200 covered bridges in Illinois during the 1800s, and between 1930 and 1880 such wooden trussed structures were preferred for bridges. Covered bridges offered several advantages over other methods of construction, the most important being that the roof and siding protected the bridge's wooden support system from the elements, much as the roof and siding on a house protects its contents. Covered bridges sheltered many a traveler from sudden storms. In addition, cattle often could not be driven across open bridges, but they readily crossed covered bridges. Early settlers claimed the covered bridges reminded cattle of the barns in which they normally found food and shelter. The Thompson Mill Covered Bridge crosses the Kaskaskia River one-half mile north of Cowden and 2.5 miles east of Illinois Route 128 in Shelby County. The bridge was built in 1867 a short distance from Lillie's Mill on a major highway from Springfield through Taylorville to Effingham. The bridge may have been named for a previous bridge at or near the site beside which stood a mill owned by John Thompson, who claimed the surrounding land in 1839. It has also been called the Dry Point Bridge for the township in which it is located. Shelby County appropriated $2,000 for the bridge and later added $500 for roofing and siding. It has an overall length of 160 feet with a covered span of 103 feet. The original timbers are still intact, and the roof and siding have been restored. Sugar Creek Covered Bridge crosses Sugar Creek about three-quarters of a mile west of 1-55 and three miles south of the Lake Springfield Bridge in Sangamon County. It was built around 1880 by Thomas Black and has a 60 foot clear span. 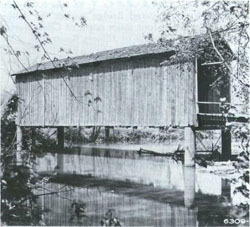 Sugar Creek Covered Bridge was restored in 1965 following passage of a state law requiring covered bridge maintenance. Further work is being done now with funds from the Intermodal Surface Transportation Enhancement Act grant program. made of hand hewn native black walnut. The bridge was restored in 1982 following a flood, and the restoration work won a Historic Preservation and Cultural Enhancement Award from the U.S. Department of Transportation. Mary's River Covered Bridge crosses the Little Mary's River about four miles north of Chester and along the southeast side of Illinois Route 150. The bridge was built in 1854 of hand-hewn native white oak timber and was in constant use through 1930. Construction was financed through proceeds of a toll road between Chester and Bremen known as the Randolph County Plank Road, which the bridge carried over the Little Mary's River. A vital link in the road, the bridge aided the passage of farm products from the area to the busy river port of Chester. The structure is 86 feet long and rests on its original stone abutments. The bridge is located on land that was presented to the State of Illinois, and was restored in 1954. The Red Covered Bridge crosses Bureau Creek 1.25 miles north of 1-80 and half a mile west of Illinois Route 26 near Princeton. Demand for the bridge began in 1862, and the Bureau County Board of Supervisors responsed to the demand by appointing a bridge building committee. Selected by a meeting of Bureau County residents at a meeting on March 7,1863, the members of the Union Bridge Committee oversaw the construction and financing of the structure. The bridge was completed in 1863 at a cost of $3,148 and features a 95-foot main span resting on masonry piers. It was built to serve highway traffic on a major road between Peoria and Galena. A sign on each end advised everyone of the rules governing use of the bridge: "Five dollars fine for driving more than twelve horses, mules or cattle at one time or for leading any beast faster than a walk on or across this bridge."